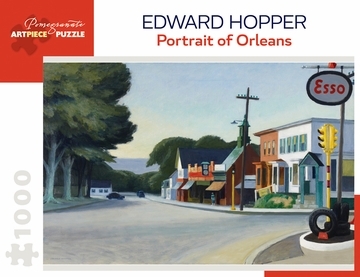 Edward Hopper’s distinctive oil paintings convey subtle emotion, often construed as loneliness. A single figure populates Portrait of Orleans, imparting a sense of silence to the nearly deserted scene. Still, Hopper (American, 1882–1967) repeatedly maintained that his interest lay in capturing light rather than conveying a mood. “I like long shadows and early and late sunlight. I am very much interested in light, and particularly sunlight, trying to paint sunlight without eliminating the form under it, if I can.” Hopper traveled throughout the United States for more than forty years, recording everyday views of people and their surroundings.